Laurelwood Falls Cabin-A Romantic Creek Side Retreat with Waterfalls too! 1 Bed / 1 Bath, Creek Side Cabin with a Fireplace, Hot Tub, and Jacuzzi Tub. 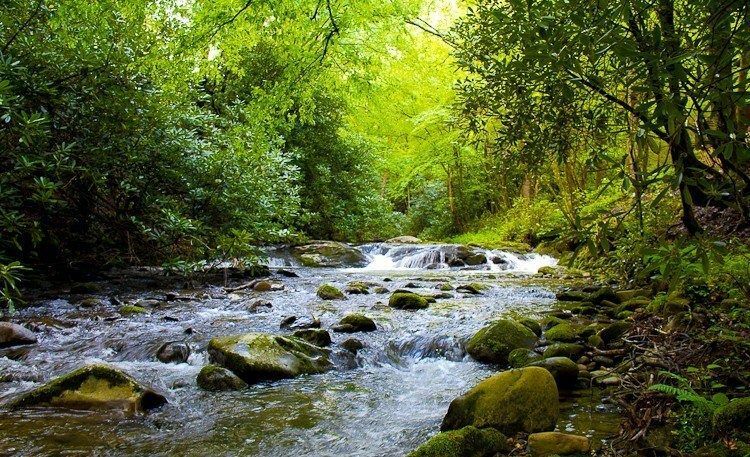 The cabin is nestled in the trees along a rushing creek in the Smoky Mountains near Gatlinburg, Tennessee. Cozy up next to the fireplace, soak your worries away in the hot tub, and fall asleep to the sound of waterfalls from the rushing creek. The cabins are equipped with everything you need to relax and escape the hustle and bustle of the city, but are just a short 23 minute drive if you'd like to do site seeing or go out to a romantic dinner. This property is for 2 adults only, no children are allowed on the property. Also, this is a pet friendly cabin, with prior approval from the Owner and Pet fee and Pet Deposit paid. Please email the property manager if you would like me to consider your pet to stay at the cabin. Please e-mail the breed, hair type, and weight of the dog. Also the fees listed are per pet and must be approved first. Please be sure to include your phone number on Homaway information, so the property manager can contact you if needed. My wife and I have enjoyed this same location on 5 occasions and are always revived after relaxing at Laurelwood Falls. I can guarantee we will visit again! Romatic, peaceful, great even if rainy cold weather, you don't have to feel guilty! Thank you for a wonderful cabin! This is our second year here and it’s just as beautiful as the first time we stayed here! We took a short honeymoon here as we just married on 11-2❤️ But will definitely make this our anniversary spot yearly!! We are in love with this cabin and couldn’t ask for anywhere else as peaceful and beautiful. Thank you for sharing this peace of HEAVEN with us.. Loved this nice little quiet cabin. The cabin on the river was awesome. As advertised, the Laurelwood Falls Cabin was in a tremendous setting! A rushing stream complete with a waterfall is just feet behind the cabin, all nestled in the foothills of the Smokey mountains. Fall asleep to the sound of the rushing stream. Relax in the hot tub on the deck to the sound of the stream. It's plenty big enough for two! Since our stay was after Oct 1, we could use the wood burning fireplace which added to the romance of the evenings. Plenty of firewood was supplied in a storage unit just outside the cabin. While the cabin does have WiFi, don't plan in getting any serious work done as the connection is DSL which on a good day gets you ~1Mbps. But hey, you are on vacation! Works plenty good enough to check the weather and browse the web sites of the local attractions and restaurants. The cabin is well equipped with the essentials. Quiet, beautiful for our 35th wedding anniversary. Absolutely beautiful and quiet. Listening to the water falls were very pleasant. We had our morning coffee and dinners outside watching and listening to the water falls that took all our stress down the river. The cabin was very clean and equipped with every item that was needed.. The only complaint I have is that it was very hard to leave such an amazing vacation! Thanks to all the staff for your wonderful hospitality! I would and will suggest that this is the place to go to get the best stress relief.